A FIRE caused by several explosions has injured 15 in Madrid. 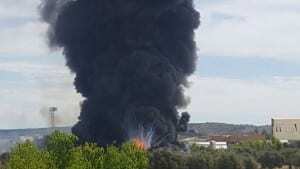 Several explosions occurred at a chemical factory in Arganda del Rey just outside of Madrid, seriously injuring three people. A thick plume of smoke erupted from the scene as a result, however an air quality reading showed normal results. The cause of the incident has not yet been established.